If you have ever watched ever it's likely you've already heard some word related to "magic." Be it mahou 魔法, also romanized mahō, majutsu 魔術, madou 魔道, maryoku 魔力, mana マナ, and so on. In this post I'm going to list the meaning of these magic words in Japanese and some common phrases about magic used in anime. mahou 魔法, which is the most common. Used for witchcraft magic in general. Its literal meaning would be something like the "magic method," the "magic principle." For example, one bun 文 is a "sentence," but bunpou 文法 means "grammar," the principle which governs the sentences. majutsu 魔術, a little less common. It's literal meaning is a "magic techniques" or "magic arts" and would lean towards expertise and training of magic rather than just *boom* magic! For example, ninjutsu 忍術 means "ninja arts," the techniques a ninja 忍者 uses. madou 魔道, even less common, not exactly the same meaning. Literally "magic path." In the sense of walking the path of magic. "Sorcery." Etc. Think of samurai 侍 and their bushidou 武士道, "path of the warrior." tejina 手品, this has nothing to do with supernatural magic! This word is for "magic tricks," the ones made by show magicians in, well, shows. This post is about mahou and majutsu, real (fictional) magic. Not the fake magic trickery that is tejina. In manga, anime and Japanese games, the generic term mahou is used exactly like we use the word "magic" in English. That is, randomly. In one story magic works one way, in another it works another way. And yet we call both magic, or sorcery. What's a witch, wizard, sorcerer, magician, and so on also change on work-by-work basis. They are fantasy terms. They are flexible. Just like we do in English, you can combine the words for "magic," mahou and majutsu, with the words for colors in Japanese to create "black magic" and "white magic." Some games, like Final Fantasy, have other colors of magic like "red magic" and so on. The principle is the same for those too. Besides the above there's also some other forms, plus the masu, masen, mashita, masen deshita polite forms. But that's the gist of it. (Somebody) became able to use magic. I became able to use magic. I want to use magic. I'll work hard to become able to use magic. Witch. Wizard. Sorcerer. Magician. Etc. A 30 year old virgin. It's a meme that if you're still a virgin at 30 years old you turn into a wizard. See Tensei Shitara Slime Datta Ken for reference. Magician... the stage kind in magic trick shows... I said we weren't dong this kind of word! 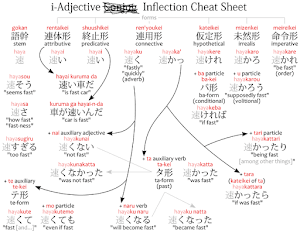 Although I, personally, used the translations above, the Japanese lexicon doesn't match exactly the English lexicon. That's to say a word like "magus" can be used as a translation for mahou tsukai, etc. even though I didn't include this word above. It depends on the translator and a lot of other factors, but the general idea is as above. Note that though there is a word for "magic woman" "witch," majo 魔女, written with the kanji for witchcraft 魔 and woman 女, there is no such word for male witches. Just like there is no such word for male witches in English either. 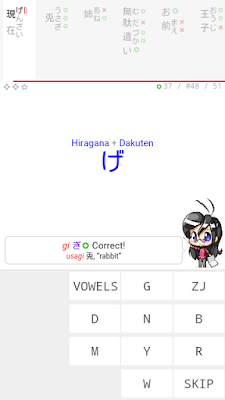 You can't switch 女 for 男, the kanji for man, and have manan 魔男 or madan 魔男 or whatever. That word does not exist. However, though I've personally never seen it happen, do note that it's possible that the word majutsushi 魔術師, the gender-neutral "magician," is added as a furigana 振り仮名 for the kanji 魔男. So in a story where magic-users are women, majo 魔女, for example, a male magic-user shows up and he could be introduced as a majutsushi 魔男 using the kanji for man and the reading for the gender-neutral word. 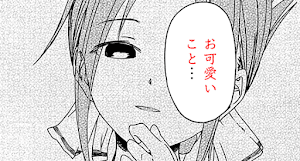 Conversely, just because majo exists for witch women, that doesn't mean mahou tsukai, madoushi, majutsushi, etc. are male-only terms. You can have a character that is a mahou tsukai and is a woman in an anime where magic users don't look like witches but sorcerers or something. 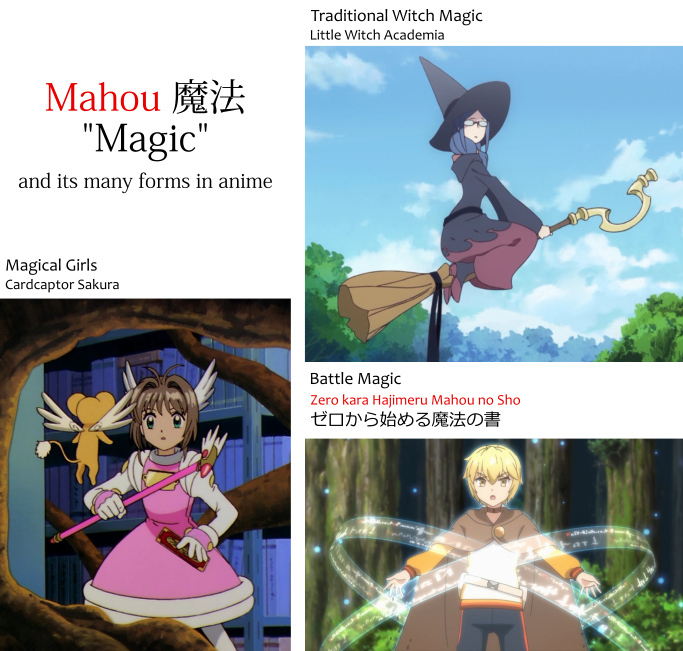 Another thing: mahou shoujo 魔法少女 is an anime word in the sense of anime "magic girls" or "magical girls," you know, the transforming kind like Card Captor Sakura, Kaado Kyaputaa Sakura カードキャプターさくら. It's a little different from saying "a girl who uses magic," mahou wo tsukau shoujo 魔法を使う少女, for example. mahoudue 魔法杖 or mahou no tsue 魔法の杖, "magic cane" or "magic staff." This is usually the weapon-of-choice of mahou shoujo's everywhere. A "cane," tsue 杖, that is magic. houki ほうき or houki 箒, "broom," not necessarily magical. A normal broom. You can say majo no houki 魔女の箒 to mean a "witch's broom," or mahou no houki 魔法の箒 to mean a "magical broom." boushi 帽子, "hat," again not necessarily magical. Witches usually wear a a hat, or a "witch's hat," majo no boushi 魔女の帽子. bou 棒, "stick" or "pole." In witch and magic context it usually refers to the magic wand, or rather, the "magic stick," mahou bou 魔法棒. A different, more specific word would be wando ワンド. There are a number of Japanese words that often appear in the context of magic and witchcraft. maryoku 魔力, literally "magic power." It can be used for things that have some "magic power," like swords, talismans, etc. But in anime it usually refers to that thing magicians always run out of at the most important part of the story. 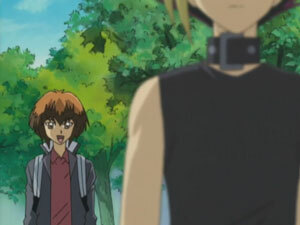 The magicians use magic, they spend maryoku, then they can't use magic anymore. Because "there's not enough magic power," maryoku ga tarinai 魔力が足りない (literally: "magic power is not sufficient"). mana マナ is that common game word for magic power that runs out. Sometimes, in games, mana is written with the the kanji for maryoku 魔力, or rather, 魔力 is supposed to be read as mana. There are also times where either mana or maryoku is written as MP. mahouen 魔法円, "magic circle." Those used to cast magic. In some anime these appear out of thin air... in the air. mahoujin 魔方陣, this usually has nothing to do with magic, but refers to a math puzzle called "magic square" where you have a 3x3 square or bigger with some numbers and you have to fill the empty spaces without repeating the numbers so that the sum of each row. column and the diagonal is equal a given number. madougu 魔道具, "magic tool," literally the word "tool," dougu 道具, with ma 魔 slapped behind it. madouseki 魔道石, "sorcery stone," usually translated as "sorcerer's stone." Basically the same thing as a maseki. In Little Witch Academia, the madouseki are the magic stones that allow the witches to use magic. mahou yaku 魔法薬, "magic drug," "magic potion." This is used strictly in the Harry Potter witch sense. In games, magic "potions" and the sort are usually called pooshon ポーション. As in HP pooshon HPポーション and MP pooshon MPポーション. madousho 魔道書, mahousho 魔法書, "magic book," a "grimoire." Popular magic item in games and anime. Sometimes the book has a title or author, so it becomes something or someone no sho の書, as in Zero no Sho, "Book of Zero," from the anime Zero kara Hajimeru Mahou no Sho ゼロから始める魔法の書. rei rain レイライン, loaned from "ley line." A common magic concept where invisible magic rivers wrap the world and magic users use the energy from those ley lines to cast magic. majogari 魔女狩り, "witch hunt," the burned-at-stake kind. A "hunt," kari 狩, of majo's. majo saiban 魔女裁判, "witch trial." A "trial," saiban 裁判, for witches that are being hunted. If this happens to you be sure to check out the Gyakuten Saiban (Ace Attorney) game vocabulary list so you don't end up at the stake. ma 魔. This usually refers to demons and evil spirits in a generic way. 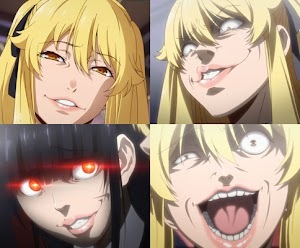 These are said to have a bad influence on people, or rather, an evil influence. Think of it as if magic, mahou 魔法, would be the "evil arts" the "evil women," majo 魔女, use. akuma 悪魔, written with the kanji for "evil" 悪 and for the "bad influence" 魔, the word akuma means "demon" in Japanese. You can use ma 魔 to talk about an evil unseen spirit that influences somebody, but akuma is usually the physical evil beast thingy. jama 邪魔, this means "in the way" and has nothing to do with magic. Okay, maybe a little. When somebody is talking about an spirit posing an "obstacle" in somebody's life, they may use the word jama 邪魔, but the most common case of it is when an actual human being "becomes a nuisance" jama ni naru 邪魔になる. Another common use: jama da! 邪魔だ！, "you are a bother!" "you are in the way!" "outta here!" "gtfo!" etc. tsukaima 使い魔, "(witch's) familiar spirit." This word is a little complicated. So far we have been talking about mahou tsukai 魔法使い, "magic-user," which comes from mahou wo tsukau 魔法を使う, "use magic." However, tsukaima 使い魔 is different. It uses the word tsukai 使い as an adjective for the word ma 魔, that is, an "spirit" that is a tsukai 使い. tsukai 使い, a "servant." If tsukau 使う means "to use," a tsukai would be "someone that's used" or something like that. If we were talking about "heaven," ten 天, one ten no tsukai 天の使い would be one "person who is used by the heavens" or a "servant of the heavens," also called a tenshi 天使, "angel." In the same sense, a tsukaima 使い魔 is an "spirit that's used" or "servant spirit." A "familiar." maken 魔剣, "cursed sword" or "demon sword." A common kind of "sword," ken 剣, found in Japanese games and RPGs. mazoku 魔族, "demon clan," "family (species sense) of demons." The word mazoku refers to the demon race, technically. It goes alongside other words like kazoku 家族, "(one's) family," and kizoku 貴族, "noble (aristocrat)," "nobility." mamono 魔物, another word for "demon." Because it doesn't have the kanji for "evil" in it like akuma does, it might mean less-evil monsters, but who knows? In Konjiki no Gash-Bell!! 金色のガッシュベル！！ (Zatch Bell), Gash and the other pokémons demon children are mamono's. majin 魔神, one more word for "demon." This one is closer to "genie" as it's literally "demon god" or "evil spirit god." It uses the same kanji as "god," kami 神. Note that, in games, a majin isn't necessarily god-tier powerful. It's pretty common to have mamono, akuma and majin as just names for three random mob monsters of somewhat different strength. makai 魔界, "demon world." Also translated as "hell" or "underworld." It's the "world," sekai 世界, of the spirits and or demons. 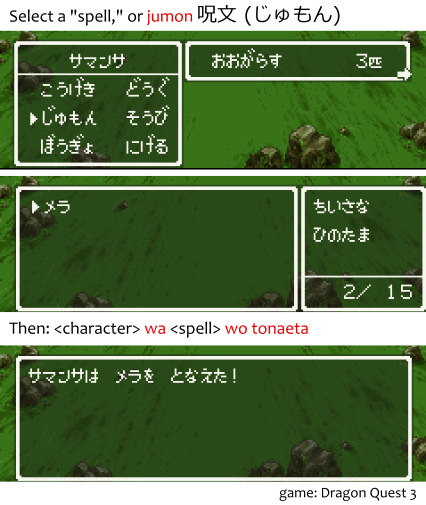 In Japanese RPG games, the spells used by the player and other character are not given the name of "magic." Sure they are magic, but they are not called "magic," they are called "spells." Now, I know we just saw a bunch of words about "using" magic, but spells are not "used" the way magic is. Spells are "chanted." Luckily, you don't see other conjugations of the tonaeru verb much. The phrase "chant a spell" is also rare. Usually, in games and RPGs, the name of the spell is used instead. As in "character chanted XYZ" or "character cast XYZ." To have been cursed by a cat. Note that the above words are for evil magic "curses," the "I shall curse you for eternity!" kinda curse. Not the cussing / swearing kind of cursing. There is a male word for witch in English: witcher. "Witcher" is a relatively new word coined specifically for the Witcher novels when they were translated from the original polish language. The original english word for a male witch is "Warlock". Since the type of person described in the novels and games wasn't really the traditional idea of a witch, they used the newly coined term. So Mahoujin is the 3x3 game Sudoku.